In the Southwest, the Mexican free-tailed bats are primarily cave bats that migrate long distances into Mexico to winter. The subspecies inhabiting the southwestern United States is present in very large numbers. High temperatures in roosts are essential for rapid growth of young bats. Apparently the larger the colony, the less the energy expenditure per bat to maintain a given temperature. Babies seem to be able to tolerate higher temperatures than adults. One baby is born in late spring or early summer. Birth occurs with the mother hanging head downward, with passage of the baby through the birth canal requiring only about 90 seconds. Newborns are hairless, but have all their milk teeth. Mothers can locate their own baby among the thousands of babies in a colony. 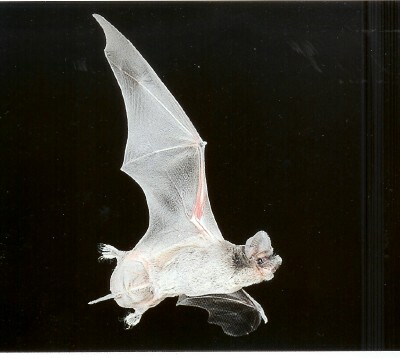 This article is from "Bats of the United States", 1999, by Michael J. Harvey of Tennessee Technological University, J. Scott Altenbach of the University of New Mexico, and Troy L. Best of Auburn University. Published by the Arkansas Game & Fish Commission, in cooperation with the Asheville Field Office of the U.S. Fish and Wildlife Service.